Hi! I work for UBC's Centre for Teaching, Learning, and Technology as a strategist for open education initiatives. I am engaged with projects that are leveraging technologies, approaches and pedagogies to support open learning and scholarship. With a background in library science, I am interested in understanding and supporting the removal of barriers that limit access to, and participation in, education, information, and knowledge. My contact information is available at https://ctlt.ubc.ca/people/will-engle/ and my blog is here: http://blogs.ubc.ca/open. ↑ MediaWiki as a Transformative University Platform: Creating an Institutional Gateway to the Commons. Wikimania 2015. Mexico City, Mexico. ↑ "UBC Student API Hackathon". ↑ Engle, Will (2017). "UBC Textbook Displacements by Open Resources". Open UBC. ↑ OER Accessibility Toolkit. Open UBC. ↑ Engle, Will (2019). 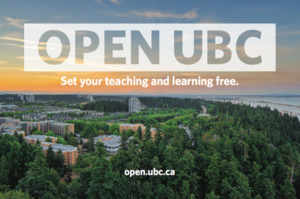 "Open UBC Snapshot: Significant Use and Support for Open Resources". Open UBC. This page has been viewed over 354 times. This page was last edited on 12 April 2019, at 16:34.